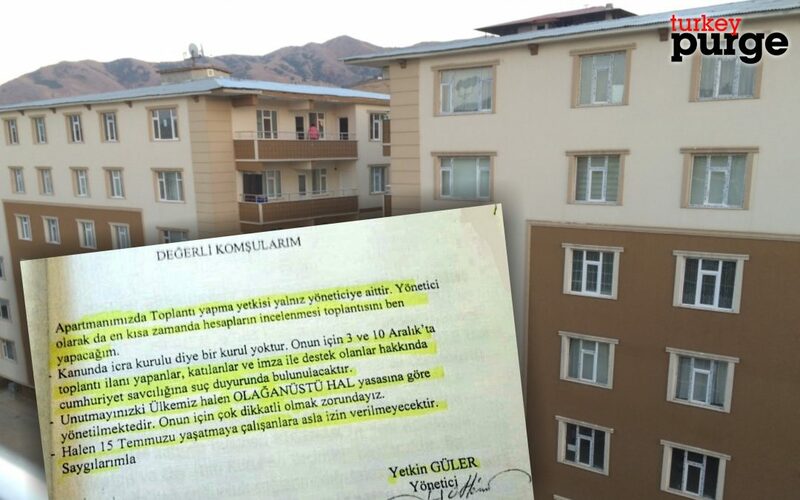 A widely shared social media post suggests that even apartment superintendents began taking advantage of the post-coup emergency rule in order to suppress dissent. While authenticity of the post has yet to be verified, Turkey Purge publishes it with consideration that absurdity is Turkey’s new normal given the fact that even a football referee was arrested over coup charges. “My dear neighbors,” Yetkin Güler, reportedly an apartment manager, said at the beginning of his announcement to the residents of the building. What follows is the translation of the full text of the announcement. “• The manager has the only authority to arrange a meeting at the building and as the manager, I will hold a meeting very soon with regards to examination of the accounts. • There exists no committee called executive board in the regulations. For this reason, a complaint will be filed with the Public Prosecutor’s Office against those who made a call for a meeting on Dec. 3 and 10, and who signed the call in support. • Don’t forget that Our country is still ruled in accordance with the STATE OF EMERGENCY. Therefore, we must be very careful. • Those who still try to honor the memory of July 15 won’t be allowed to do so.